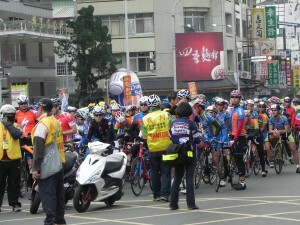 The 2011 Tour of Nantou was held on Saturday. The day was overcast but the rain held off and everyone was treated to a couple of hours of great racing. 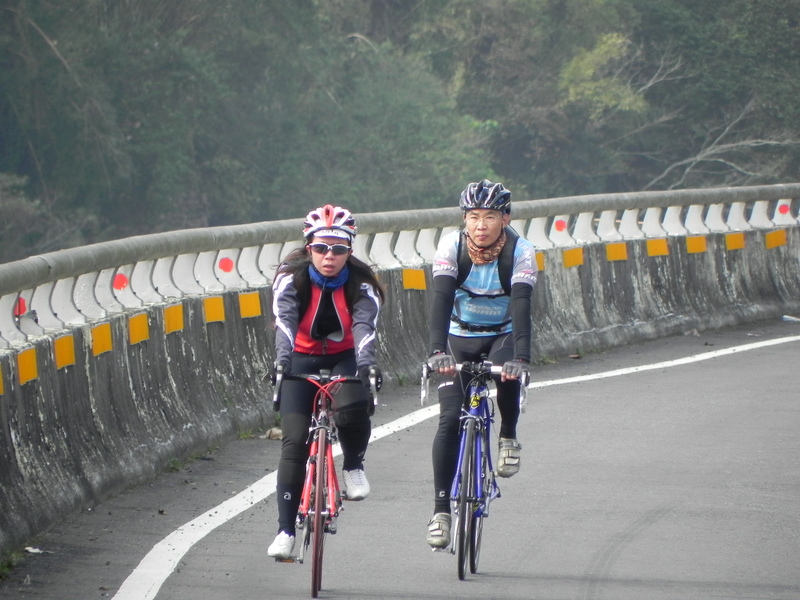 The route was from Puli in central Nantou down towards the coast, returning to to Puli along the same road and then finishing in a 15km climb to Sun Moon Lake. 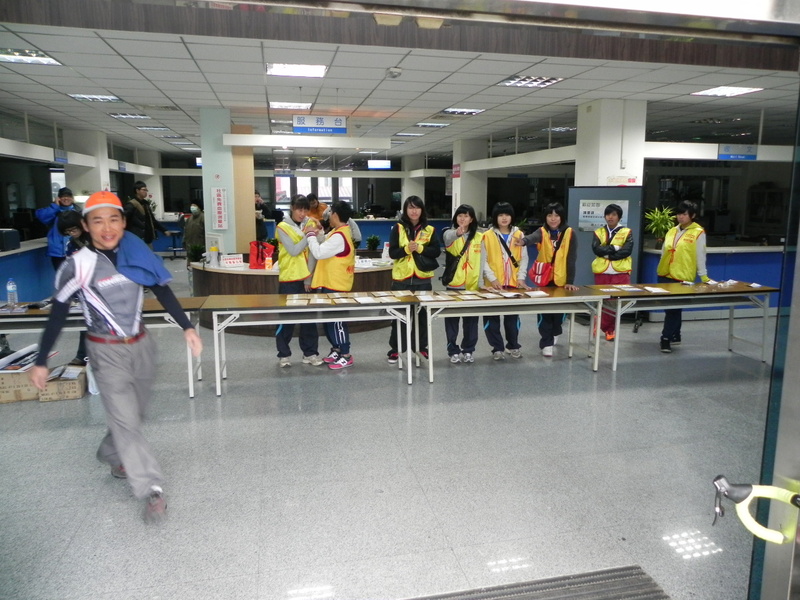 Racers were divided into two groups. The first consisted of elite-level racers and the RM20 and RM30 division cyclists. The second contained the RM40, RM50 and 7 female racers to compete. 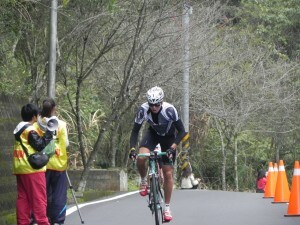 Both groups completed the course in tight pelotons that only broke up in the last few kilometers as the climb to the finish began to favor the climbers. 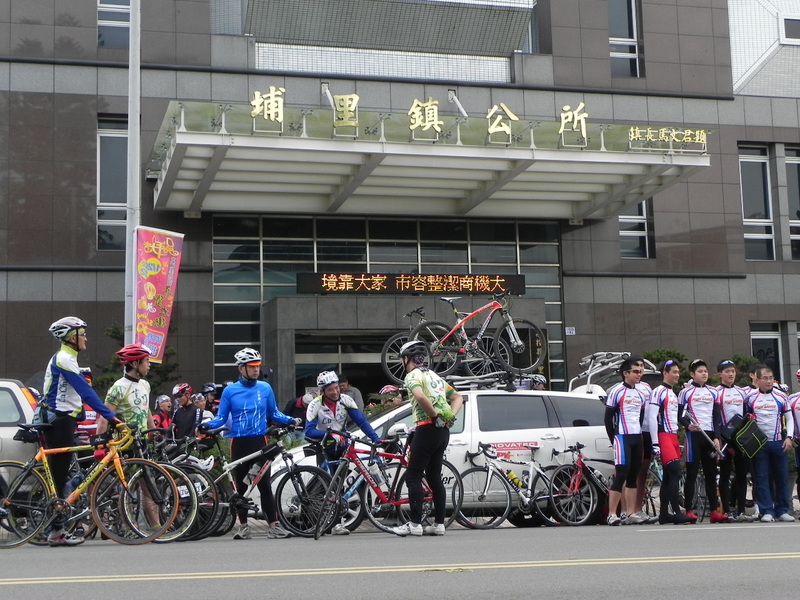 From early in the morning cyclists began to gather in the vicinity of the start. First order of things was registration – pick up your number. Plenty of elite-level bikes just about everywhere you looked. Everyone was getting set for the staggered departures at 9.10am and 9.20am. 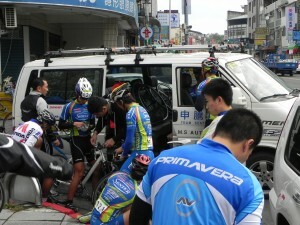 The team that was to dominate, Senter-Merida (Kaohsiung-based bike shop) pulled up just behind my team’s staging area. Breakfasts were eaten, derailleurs checked, and a few warm-up laps around the block completed. 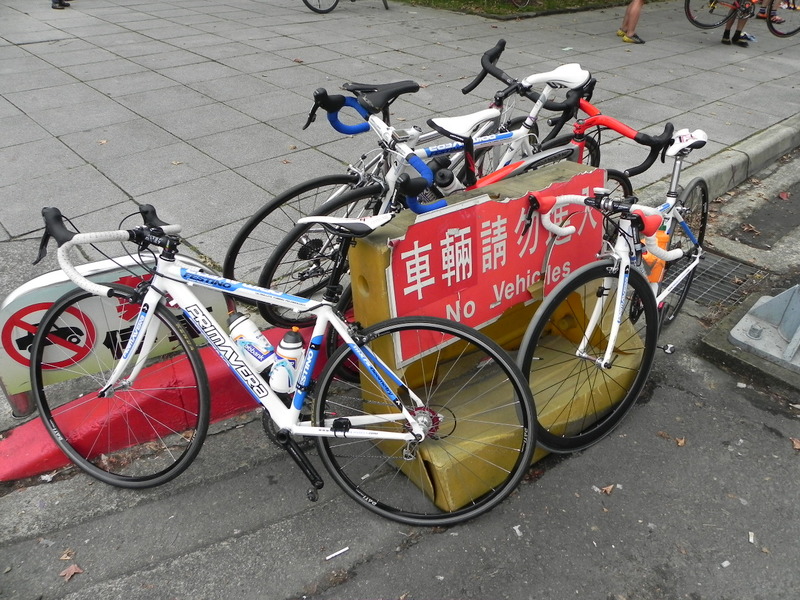 We had claimed our place early on and thought that, despite the sign, nobody would object to us temporarily stowing some of our “vehicles” here as the time to depart drew closer. There’s always a great spirit in the air at these events. Everyone is really psyched and can’t wait to get going. 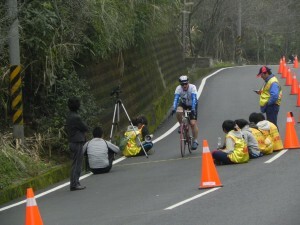 This particular event was targeted by fairly high level riders. Participants were restricted to 500 with no MTBs allowed. 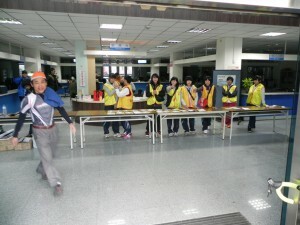 The first group prepares for their departure. I made my way to as strategic a spot as I could on the course. 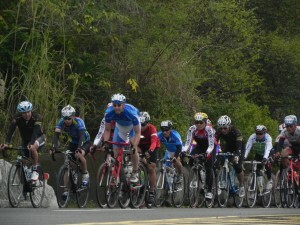 It was not long before the peloton of the leading group came roaring along. The short video clip shows them at the half way mark. On the right are two of my young hopefuls. 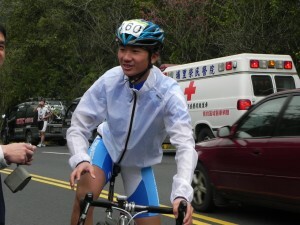 Wen-Yen, who went on to get a 7th placing, is visible on the right side in the blue jersey. He sticks his head up out of the peloton, perhaps to see where his team-mate, You-Zheng had got to. 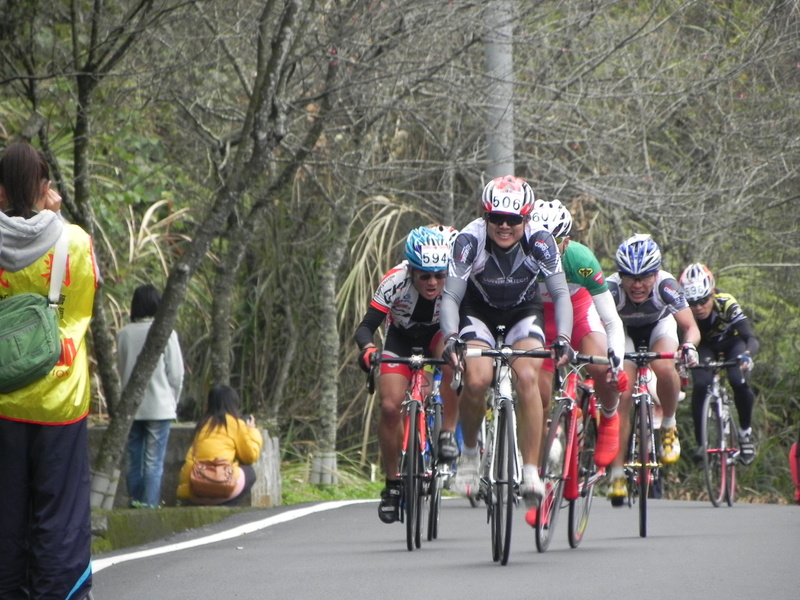 Here is a shot of the 2nd peloton with three of my team members, numbers 715, 530, and 632 setting the pace and supporting each other well. They were not all that far behind the first peloton and were soon passing many of that group. The winner of the ladies division, 陳怡孜, was right amongst the peloton the whole way. Riding for the Gigantex team she clocked 2:13. Well done!! There were quite a few cyclists, such as these two, who were out riding for the day not part of the event. 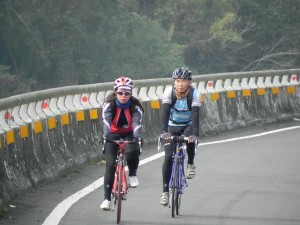 There were also one or two sightseers traveling slowly by car on their way to Sun Moon Lake for a relaxing day. 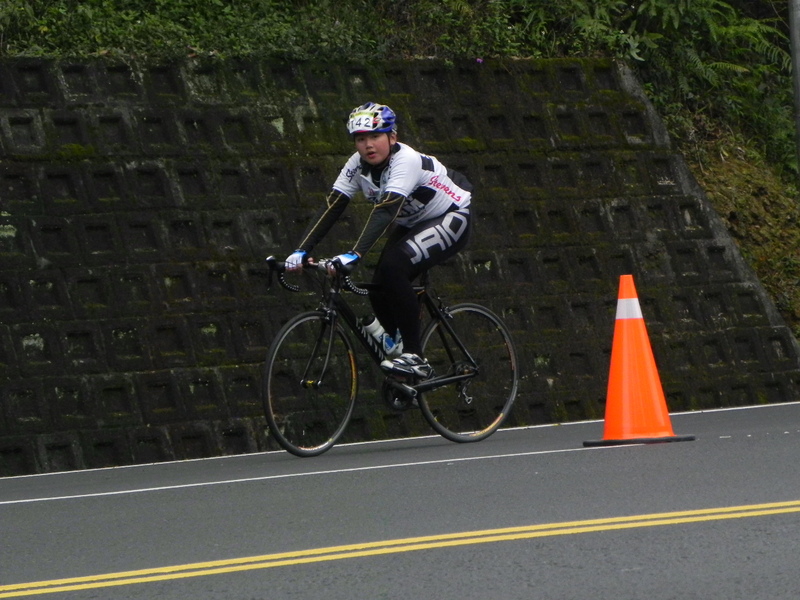 One was caught by the second peloton. Despite frantic whistling and yelling by a course marshal on a motor scooter, and then the police car that was ahead of the peloton making sure the way was clear, they just kept cruising along. The officials weren’t enough to move them on. But the peloton was. It seems they looked in their rearview mirror to see a gathering storm of fire-breathing cyclists about to swallow their car and suddenly took off very quickly indeed.! 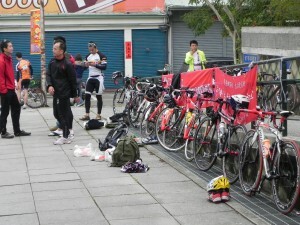 The organizers placed the finish just below the entrance to Sun Moon Lake. Just behind me you reach the top of the hill and the vista of the lake spreads out in front of you. Like last week, it was cold and foggy. They used a stop watch to record times and make a written note of the number resulting in a few mistakes. One of these was one of my team members being recorded as winner of the RM50 division. 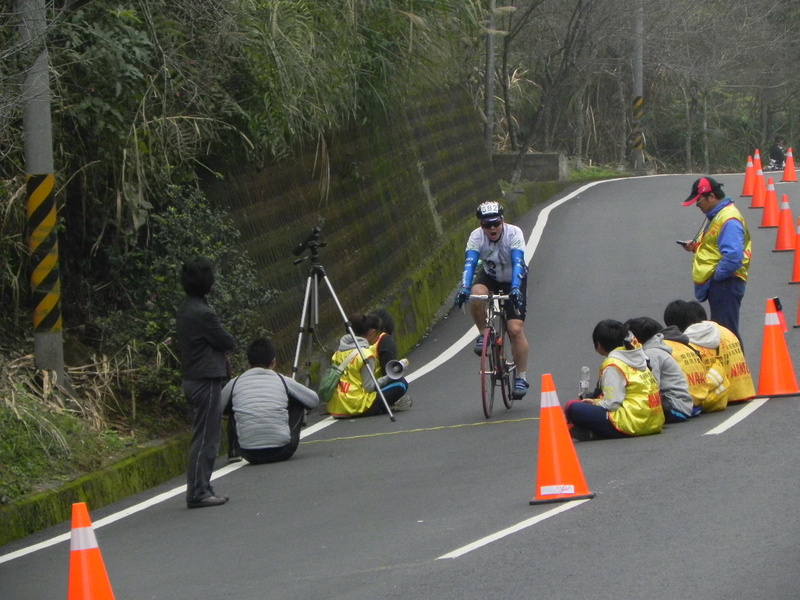 Actually, he was in a fall early in the event and failed to finish! He’s ok, just a bit scratched up. His main problem is some painful damage to his lower rib cartilage that will take a few weeks to heal. The overall winners in the event clocked a time of 2:02. The group pictured here came in not long after at around 2:08. 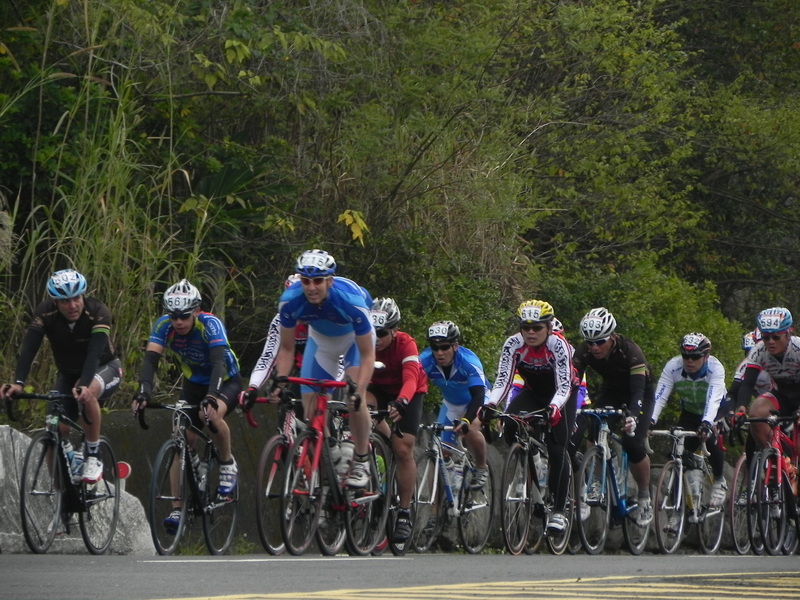 Just to the right of, and a bit behind, 506 on the front is Simon (李也剛) who featured in last week’s training ride. He was equal 7th in his RM40 division. This CCT team member came home in style clocking 2:14. Wen-Yen clocked 2:03 and 7th place overall. When asked here how he felt he said “I’m going around the lake”, which he did with quite a few others. 75km was just not enough for these enthusiastic young riders. 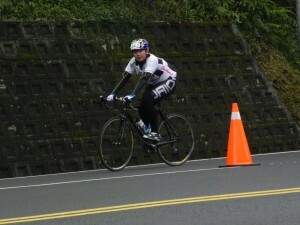 This teenage rider clocked 2:58 in the RM20 division. He just kept plugging away at it. Great job! It was an exiting morning’s racing. 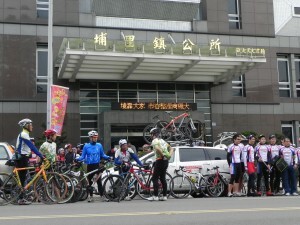 The next event will be up in Taipei on the weekend before the Taipei Show (Taipei Cycle 2011). With the Tour of Taiwan, Taiwan’s premier racing event also happening in stages at the same time either side of this weekend , it sure is shaping up to be a busy time. Great Photos and recap- Your story really brightened a dreary day in Pittsburgh!